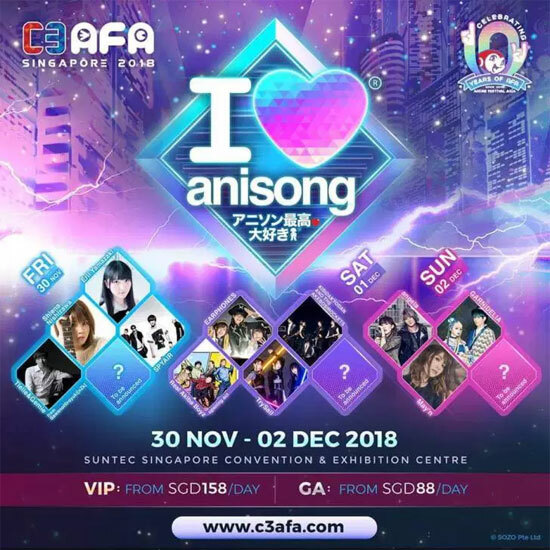 C3 Anime Festival Asia Singapore 2018 is coming again and this is the ten years that it happen in Singapore! This event celebrate the best anime, cosplay, gaming, and anisong to the region! #C3AFASG18 promises anime fans and Japanese pop culture enthusiasts three amazing days of exclusive content and unique experiences direct from Japan! See the full list of ILA acts featuring artistes such as SPYAIR who are performing in Singapore for the very first time and returning acts such as May’n and Shiena Nishizawa. See the full list over at here! See anime, manga, light novel, and game characters come to life in the form of Star Cosplayers including Baozi & Hana (China) and Angie (Malaysia). Read more of the guest cosplayer here! Singapore’s best cosplayers will gather to battle for the chance to represent Singapore at the World Cosplay Summit in Nagoya. You can get the ticket here!